As a responsible employer, the Practice has a duty as a provider of NHS healthcare to protect the health, safety and welfare of staff under the Health & Safety at Work Act. This includes a risk assessment of violence towards staff and taking steps to mitigate this under the Management of Health and Safety at Work Regulations 1999. Staff members who are victims of violent conduct or assault have the right to sue their employers for compensation if the risk of violence could have been reduced or removed completely, but the employers did not act upon this information. The practice acknowledges that there may be instances where violence and / or aggression forms part of a patient’s illness. In these circumstances, the issue will be discussed with the patient and form part of their care planning. This information will be recorded in the patient’s medical record and flagged to ensure that members of staff are aware. In addition, where deemed necessary, appropriate support will be put in place, e.g. staff members do not see the patient alone. Actual physical assault (whether or not it results in actual injury) includes being pushed or shoved as well as being hit, punched or attacked with a weapon, or being intentionally struck with bodily fluids or excrement. The Practice supports the Zero Tolerance stance adopted by the NHS. "Any incident, in which a person is abused, threatened or assaulted in circumstances relating to their work". Carry out risk assessments to assess and review the duties of employees, identifying any "at risk" situations and taking appropriate steps to reduce or remove the risk to employees, particularly if they are working alone. Assess and review the layout of the premises to reduce the risk to employees where physically possible. Assess and review the provision of personal safety equipment, such as alarms. Develop surgery policies, procedures and guidelines for dealing with physical and verbal abuse. Provide support and counselling for victims, or refer to suitably qualified health professionals. Make employees aware of risks and ensure employee involvement in suitable training courses. Record any incidents on a Significant Event form and take any remedial action to ensure similar incidents are prevented in future. The removal of patients from our list is an exceptional and rare event and is a last resort in an impaired patient-practice relationship. We value and respect good patient-doctor relationships based on mutual respect and trust. When trust has irretrievably broken down, the practice will consider all factors before removing a patient from their list, and communicate to them that it is in the patient’s best interest that they should find a new practice. An exception to this is in the case of immediate removal on the grounds of violence e.g. when the Police are involved. Because of the possible need to visit patients at home, it may be necessary to terminate responsibility for other members of the family or the entire household to ensure the safety of practice staff. The prospect of visiting patients that is the residence of a relative who is no longer a patient of the practice, or the risk of being regularly confronted by the removed patient, may make it difficult for the practice to continue to look after the whole family. 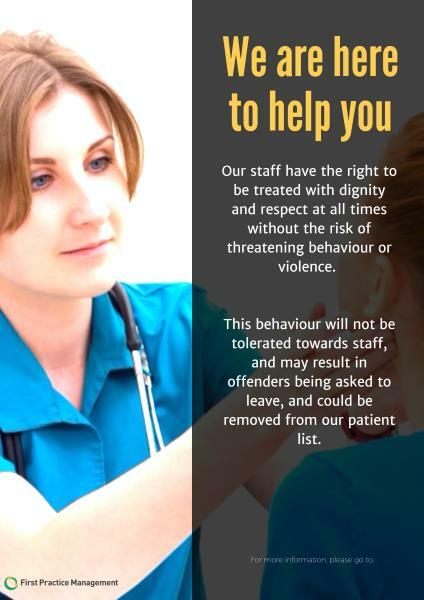 This is more likely where the removed patient has been violent or displayed threatening behaviour, and keeping the other family members could put doctors or their staff at risk.